As sure as any journey has a beginning; it also has an end. This is the same for trees. Perhaps due to old age, a freak storm or human intervention, a tree may become unsafe, a hazard to person or property or damaged to a point where other preservations methods are ineffective and costly. It is at this point that many consider the removal of the tree. A detailed assessment and analysis by an Arborist can aid you in this decision making process and determine the best course of action. 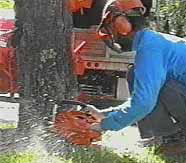 Tree removals are hazardous and should be undertaken by professionals only. The objective is to remove the tree safely, effectively and minimize risk to person and property. 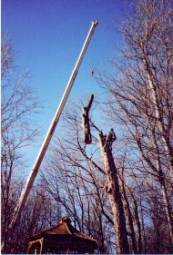 Techniques such as speed lining, the use of cranes where necessary and many other arboricultural advances are used by Arbortech to complete this task. After the brush, branches, wood and debris are removed and taken away the result is the stump. And while most people are satisfied at this stage, why not remove the stump also so that a new tree can be planted or a new garden developed. The stumping procedure turns the stump into a mixture of soil and wood chips. It is frequently beneficial at this time to attempt discover any factors that my have lead to the decline of the tree. It could have been insufficient water, too much moisture, root compaction, or poor soil conditions, to name a few. As Certified Arborists we can often ascertain the source of these problems and craft a plan to ensure that future and neighbouring trees are not similarly affected to the same conditions and improve the condition at the site.